"The funding went to Mr Bigelow's company, Bigelow Aerospace, which hired subcontractors and solicited research for the program." We wondered at the time, whether or not it would be possible to locate any of these subcontractors? We now know from sources such as the January 2018 "Coast to Coast" interviews between George Knapp,and Dr Eric Davis/Dr Hal Puthoff, that both these individuals were such subcontractors. Much has already been revealed about their roles in the program. However, what about other subcontractors? "...Bigelow was contracting up to fifty scientists, some designated to be on the scene within twenty-four hours after significant UFO incidents, to perform investigations and analyse any data the MUFON investigators had collected." Who were these scientists? It would appear that until now, not one has been identified by researchers. "By searching on the AAWSA name I also found a LinkedIn profile of a person in the Nevada area that had worked for Bigelow Aerospace between 2009 and 2010. More specifically, he was employed "in an interdisciplinary team of scientists and engineers studying advanced aerospace weapon system applications including lift, propulsion, control, power generation, signature reduction, material and armament." Immediately after reading Glassel's blog post, one of the authors (KB) searched the LinkedIn website and using key words, located this individual's LinkedIn entry. 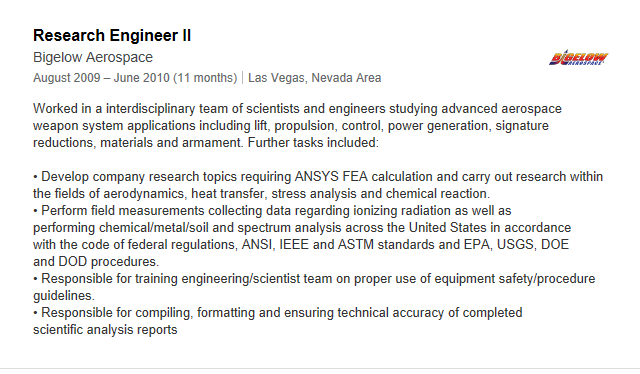 There is indeed an entry stating that this individual worked as a "Research Engineer" for Bigelow Aerospace between August 2009 and June 2010 (within the time span of the AATIP dates provided by the NYT article.) The text which Glassel refers to, is there. However, what appears below Glassel's cited text, is even more interesting. * Perform field measurements collecting data regarding ionizing radiation as well as performing chemical/metal/soil and spectrum analysis across the United States in accordance with the code of federal regulators, ANSI, IEEE and ASTM standards and EPA, USGS, DOE and DOD procedures. * Responsible for compiling, formatting and ensuring technical accuracy of completed scientific analysis reports." 1. ANSYS FEA. Ansys is a private US company. FEA = Finite element analysis. 2. ANSI = American National Standards Institute. 3. IEEE = Institute of Electrical Engineers. 4. ASTM = American Society for Testing and Materials. 5. EPA = Environmental Protection Agency. 6. USGS = United States Geological Survey. 7. DOE = Department of Energy. 8.. DOD = Department of Defense. On 1 May 2018, one of the authors (PD) exchanged communications with US researcher Curt Collins, and during this exchange received advice as to the name of the individual on LinkledIn, whom Glassel referred to in his blog post of 27 April 2018. This name matched the individual whom one of the authors (KB) had already found. The significance of this find, is that for the first time, we have part of the "job description" of one of the individuals who was conducting scientific investigation under the DIA AATIP/AAWSA program, i.e. another subcontractor beyond Davis/Puthoff. It should be recalled, that in the 28 January 2018 "Coast to Coast" interview with George Knapp; Davis specifically said of his role in AATIP, that he undertook no data analysis, nor video analysis, nor witness interviews. Hal Puthoff stated on "Coast to Coast" that his role with the AATIP was mainly to look at the physics. The investigatory role apparently belonged to such individuals as the one located on LinkedIn. We conducted a further search of LinkedIn looking for other individuals who may have worked on the same program. We have found no one else as yet. One of the authors (KB) has forwarded a request to the Las Vegas individual identified by Glassel, ourselves and Collins, asking them if they would be willing to talk to us about the work they undertook for the program? We are not providing their name due to privacy considerations. No response has been received, as at the date of this post.